SwimWay | FAQ: At What Age Should My Child Begin Swimming Lessons? Frequently Asked Question: "At What Age Should My Child Begin Swimming Lessons?" At SwimWay we begin to teach swimming when a child reaches 6 months old. 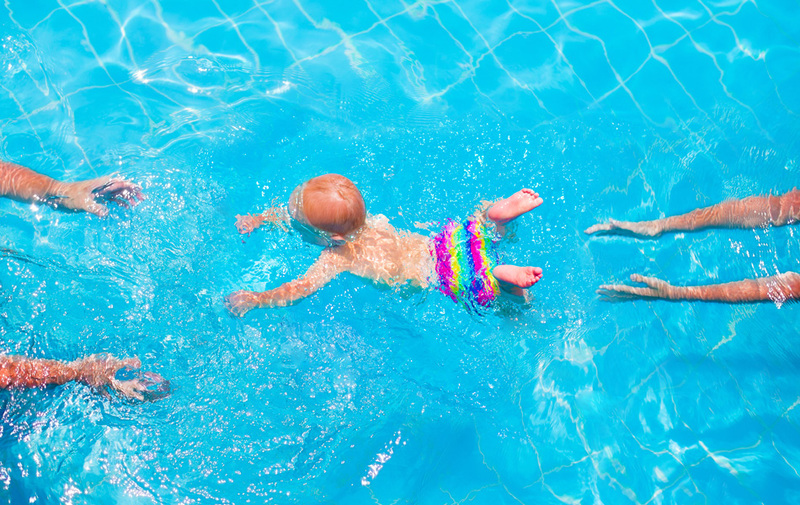 FAQ: At What Age Should My Child Begin Swimming Lessons? At SwimWay we begin to teach swimming when a child reaches 6 months old. Younger than this and babies don’t have enough neck control or eye coordination to be especially active in the water. Newborns get cold very quickly and do not shiver yet, pools must be kept very warm and 30 minute lessons might be a bit too much for them. At around 6 months babies can begin to have fun in the lessons. Children start to interact and become more aware their surrounding and of others. Younger babies tend not to notice others and won’t benefit from the social group elements of the classes. We would rather recommend things to do in the bath at this age and encourage parents to keep their babies interactions with water positive.